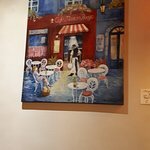 15/04/2019: Our party of four booked an evening meal table at 'Le Mistral' as it was close to where we were staying in Wirksworth. As the relatively small bar/upper restaurant area was full we were offered a table downstairs in the Cellar/Basement area, which is interestingly decorated with French motifs.We were prompted to the 'Wine and Dine' offer of a main course and a large glass (250ml) of wine. The only hiccup was that I ordered the 'Merlu' whish is supposed to be Hake, but what arrived was Seabass. After much apologising and some delay, whilst the others ate theirs; i received my 'Merlu' and was advised that my second glass of wine was to be 'on the house'. 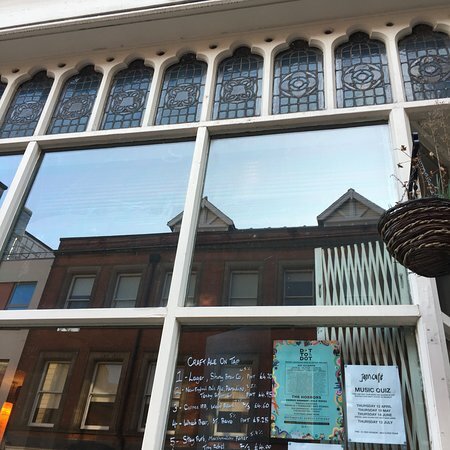 14/04/2019: We have visited the sister restaurant in Nottingham and always had a decent meal, but decided to go a little more local for my wife's birthday meal. 10/04/2019: Visited here for the first time for a birthday lunch. Very friendly service from arrival, with a lovely classy interior throughout. We had the early bird lunch deal which was great value for money. 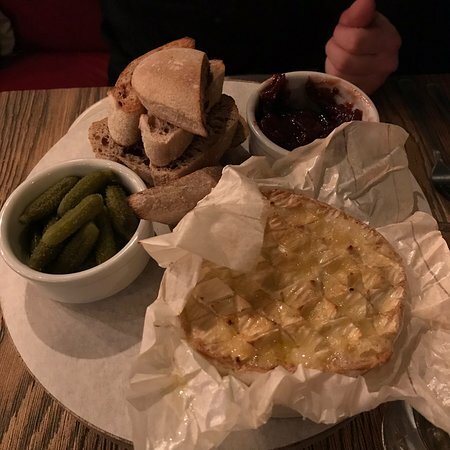 I had two courses that were on the specials menu - smoked haddock rarebit tart and blade of beef with trimmings. My partner had fish cakes followed by the chicken breast main. We both thoroughly enjoyed everything - the amount of flavour in the food was amazing. It was all washed down with a lovely white wine. Would definitely want to return again! 03/04/2019: What a jewel!. Excellent food. Cooked to perfection. Very highly recommended. We will definitely be back! 06/04/2019: My wife has been coming here for years - she always orders the same thing and says it is always the same high standard. This time she took me with her. I ordered a burger from the cheerful staff and was impressed. A bit of a messy burger (like all good burgers are) with an obviously home made patty. Lovely cheese, mayo and bacon with some fries and a nicely dressed salad and coleslaw. 15/03/2019: Este es un restaurante familiar muy agradable que es claramente muy popular y ha estado en el negocio durante muchos años. Entiendo que el edificio originalmente se usaba en un garaje, pero no deje que eso lo desanime, ya que es muy cómodo y está bien amueblado y es un lugar elegante para una comida agradable. Éramos una mesa grande pero el servicio fue rápido, atento y amable. El tema sin gluten para mi esposa fue fácilmente atendido. Hay un almuerzo de tres platos con mucha variedad disponible para alrededor de 16 y este es un muy buen valor ya que la comida es deliciosa y bien presentada. Las bebidas se compran por separado y el efectivo se paga de inmediato, por lo que puede ser un inconveniente en la mesa durante la comida. Recordamos estar en este restaurante hace muchos años y tener una experiencia muy agradable similar. Muy recomendable si estás en la zona. 23/01/2019: I came on wednesday night for a meal with my partner, we were amazed by the whole evening! 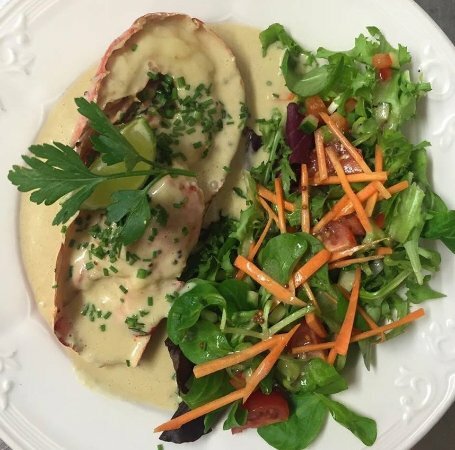 From the minuet we entered the staff were very kind and polite and catered to all of our needs, the food was marvellous and at a great price for the quality of food and the atmosphere was postive throughout. We will definitely be coming again and would recommend to anybody! 14/04/2019: On a cold morning visiting the antiques market, lunch was in order. Could not really decide what to have? 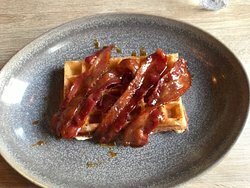 Popped into MW, it was just the tonic, I had the Croquet Madam added smoky bacon, partner had chicken and avocado, added smoky bacon, washed down with a nice glass of white wine. Desert is yet to be decided on. Highly recommend, great atmosphere. 21/05/2016: Best restaurant in town. The food is totally delicious. Very welcoming atmosphere and friendly owners. It has a family feel to it. Try it and you see what I mean. We love it! 19/05/2016: Me encanta este bistro estrafalario, la comida es fresca y a pedido, mi favorito era la tortillas, me estar siempre en algún tipo de dieta peculiar siempre cocinar fuera del menú para mí. 11/04/2019: El Jam Cafe es muchas cosas para muchas personas. Para mí, es el mejor lugar para tomar un magnífico café mientras escuchas algunas melodías en el sombrío invierno; También es mi lugar favorito para sentarse en pleno verano y tomar un cóctel largo y fresco, mientras Nottingham palpita lentamente; también funciona, después de un viaje a Meadow Lane, con una cerveza y unos deliciosos platos chinos, contratados desde U - Canteen a través del camino; y en la noche, también, en medio de Dot to Dot, cuando está embestido y huele un poco a azufre, si soy sincero, también es un lugar de craqueo. 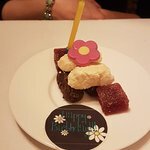 19/04/2019: Bistro Pierre is a favorite of ours, it is simple fare well prepared and several Gluten free options for my wife. Nothing is too much trouble. Carla, our waitress for the day was fab, she was attentive aware of the gluten free issues, friendly and very professional. 19/04/2019: The food here was really good quality and there was something for everyone on the menu. 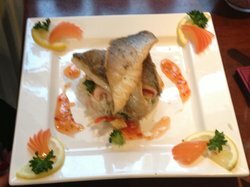 They offer a great value 2 course lunch for £12.95 or 3 courses for £14.95, and a good children’s menu for £6.95. The restaurant has a good buzz about it and the service is great. 14/04/2019: We visited Cafe au Chocolat on our way home from Lincoln. 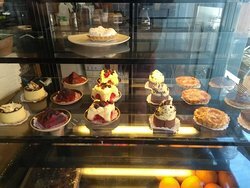 27/03/2019: We came to the cafe first time about 4yrs, very impressed with the choice, set up, yummy chocs but we were very dissappointed with a quality of not so cheap cakes, hence why expected a lot. Cakes were dry and very heavy. I am desert chef myself and I think they need to review their recipes or choose different cream for their cakes, use whipping cream instead of double or just check the process in making. Could only eat half of tje chocolate cake as felt a bit sick after,like eaten half bowl of plain ganache. Next time we came in, chose strawberry and lemon cake. Strawberry was so dry and lemon cake felt like been out for longer than should be, outer part was rubbery and didn't feel fresh at all. It was similar for another couple of visits. There is something not right with cakes there. If they tasted as they look, it would be great. But they are not cheap. We tried gallettes (savory creppes, great, freshly made), coffee, superb. I probably won't order anymore cakes for a while, hopefully it will change. British customers might not notice but if you have worked with French cakes yourself, you would know, of it is mousse, it is supposed to be fluffy and light, if you have so heavy cream, ganache type layer, add some raspberry or jelly in the middle to refreshen it, maybe some crispy layer of something else for texture etc...they are plain at the moment. Sorry. 15/04/2019: Really pleased we found this great place to eat. The service is excellent, the food is beautifully presented and our meal was delicious. We were made to feel very welcome from the moment we arrived despite being late (allow extra time if you need to use the road that crosses the railway!). 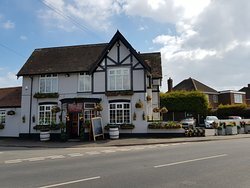 13/04/2019: Great pub , fantastic food with great portions. Food is not typical pub food it is restaurant standar, Well worth a visit. 5 stars does not do it justice and prices are reasonable especially considering the quality. The pub is equally good with some good ales. 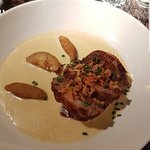 13/04/2019: Visité Mistral con un amigo para almorzar y quedé muy impresionado con la comida y también el servicio muy atento. 19/04/2019: Nine of us booked for a friends retirement meal . Table not ready at 8pm as booked, very apologetic and offered 2 free bottles of wine with the meal (really nice touch). Good cooked perfectly all very tasty...to be recommended, Thai fish cake, sea bass. Starters tasty and generous portions. Restaurant busy but staff very polite and attentive but not intrusive. will be visiting again very soon. 18/04/2019: On this visit I tried the new sea bass dish with curried mussels and samphire. It was lovely. And the ambience at the Derby restaurant is always good. 16/04/2019: Went here for dinner during a business trip. 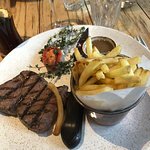 15/04/2019: Friendly staff, outstanding atmosphere, and the food is just so good! I will definitely come back here again! 09/04/2019: We went to sample the spring 2 course lunch menu at Fawsley. It was lovely. It's a small menu but there was nothing we didn't like. I had the pork escalope which was very tender; but the breadcrumb coating was a tad thick. The vegetables were beautifully cooked, but you only need one side order of potatoes as there's plenty for 2. My husband also enjoyed the wide range of beers on offer. We will treat ourselves again. 18/03/2019: 11 of us went for a meal after watching Rugby and we were treated to an excellent experience with great food. Waiters were attentive throughout the meal and the quality of the food was said by all to be very good. Cost was as expected as all Indian restaurants tend to be mid range, but the menu was varied with a good selection of specials. The toilets were upstairs but there was a stair lift for people that need assistance. 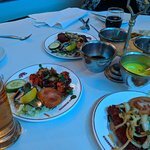 27/02/2019: Seven family members celebrating my 50th all seven of use agreed the food was amazing.. the only down side the soft drinks where all flat. Will definitely Return to this restaurant Again.